Imagine if the wheel had never been invented tricky isn't it! Take a look at this scene that shows everyday life with the wheel invented. Now, try to imaging the same scene, as if the wheel had never been invented! Would the young chap still be riding the bike? Would we be enjoying a circular pizza or a delicious round doughnut? Well these a few of the questions you have to ask yourself when putting the pieces together. 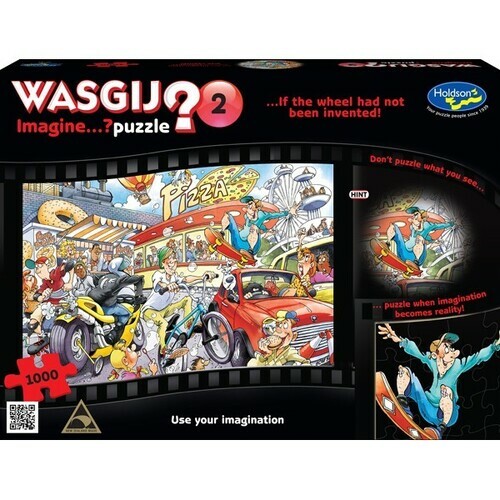 Use your imagination and curiosity to piece together what would happen to the characters and the scene printed on the box if imagination became reality. The title is: If the Wheel Had Never Been Invented.